At one stage growing chillis was a special passion of mine. Do you know how many different varieties there are? And how ornamental they are? But let's forget about me. Everybody needs to grow chillis for cooking. Even if you don't like hot food, just a little hint of chilli to warm it up stimulates the taste buds and everything else tastes just so much better. True. And chillies will brighten up your garden! Yep, some people grow chile. This is the Spanish version of the name, which you also find used in English speaking countries, especially the southwest of America. The Americans changed chile to chili. Originally chili referred to the dish chili con carne. Then it was shortened to just chili. Chili is the preferred name for the spice made from the fruit of the chile plant. But in America chili is also widely used as the name for the plant and fruit, the chili peppers. They grow chilis over there in the US. The British are growing chillis. Chilli is also the commonly used spelling in Australia and New Zealand. Permaculture originated in Australia, hence we'll stick to that version if you don't mind. Some chilli varieties are true perennials. 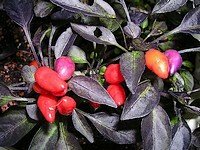 Most of the common varieties belong to the species capsicum annuum, the "annual" species. Chillies also don't mind humidity as much as sweet peppers or tomatoes do. If you live in the tropics or subtropics, great. Your chillies should thrive. Even the "annual" varieties should live for two to three years and they produce fruit all year round. If your climate is not tropical, don't despair. You can still grow chillies if you get decent summers. And you can extend the growing season by growing chilis indoors, just like you do with tomatoes. Chilli plants are usually started in seedling trays or small pots. They are very vulnerable when small and they don't grow all that fast. Still, I prefer to start mine directly in the ground, because like capsicums chillis don't like being transplanted. Actually, I only start them in the ground when I have enough seed to allow for a high percentage of fatalities. (I am the laziest gardener I know, so I don't look after my seedlings much.) I usually have enough because I save my own seed. If I buy seed of a new chilli variety and I get one of those tiny packets with barely a dozen seeds in them, then I start them in pots. If you grow chillies in seedling trays or little punnets, plant them out once they have four to six true leaves (about 5 cm tall). If you don't, their roots will start feeling restricted and it will set them back. 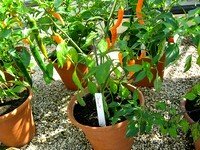 Chillies don't mind growing in bigger pots, so the timing for planting them out is not critical if you use pots. If you live in a cooler climate, use pots. Let them to grow to 10 to 15 cm. Make sure it's warm enough before you put them outside! Water the chillies before transplanting, so the soil doesn't fall apart when they're removed from the pot. Be VERY careful when removing the seedlings from their pots. Chillies grow in a variety of soils. Like most plants they grow better in rich soils and produce more fruit, but they will grow in any reasonably fertile soil and don't need any special treatment. 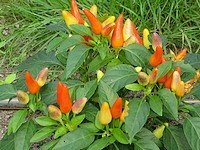 If you use plenty of mulch and compost in your garden the chillies will grow just fine. Chillies have such a tough and hardy image, people often don't realize how sensitive they are when it comes to lack of water. Make sure your chillies have plenty and never dry out. At the same time, don't overwater. The soil should be free draining. Chillies don't grow in swamps. Root know nematodes can cause the plant to wilt and die for no obvious reason. However, root knot nematodes are a sign of very poor soils. If you add lots of compost and mulch to your garden you shouldn't have any trouble. Other than that chillies grow happily and aren't bothered much by any pests or diseases. If they struggle it's usually a sign that the soil is not as fertile as you thought. To harvest fresh chillies cut or pull off the mature fruit while it's still shiny and plump. You can dry it in the dryer or sun dry it, you could also just string it up and hang it up to dry in an airy spot. You don't need to eat chillies for them to burn you! When cutting fresh chillies, make sure to scrub your hands well after. Don't touch your skin and especially don't touch your eyes! The hottest chillies can make you go blind. I am not kidding. When working with dry chilli be VERY careful not to breathe in any powder. Also don't get it in your eyes. I mentioned at the top of the page that I went through a phase of chilli growing obsession where I grew a couple of dozen varieties. They are so ornamental! However, the most ornamental varieties seem to be less hardy. They seem to need better soil, more attention, don't live as long etc. After the initial enthusiasm wore off, my innate laziness took over. The tiny fruit is blistering hot. The wild birds love them (did you know birds don't feel the heat in chillies?) and so do my chickens. 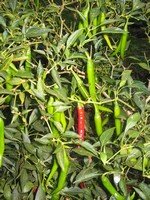 My favourite culinary variety is a type of Cayenne pepper, a medium sized bush with darker leaves and long skinny fruit of medium heat. I always have a few bushes growing near the kitchen door, and I step out there on a daily basis to get some chillies. Some of the fruit doesn't get eaten and drops on the ground where the seeds eventually sprout. From there I transplant them when I feel energetic. The third type of chilli I grow is a truly perennial type. I have a few bushes throughout the garden and they have been there forever. They bear fruit all year round, though not as much as my other two varieties. I dimly remember once, many years ago and living in a different place, I bought seed for a "Perennial Capsicum", a bell pepper that lives for many years and fruits all year round. I was a bit disappointed because it tasted nothing like the capsicums I knew. So maybe that's its offspring. Anyway, I do grow all the chillies I need and then some, without ever having to buy seeds and without putting any work into it. Who cares what they are called!